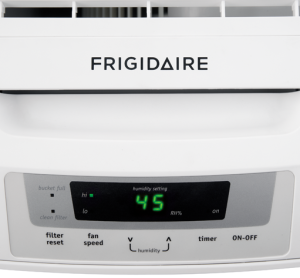 Frigidaire - FAD704DWD : Dehumidifier Review • The Air Geeks, reviews of air conditioners, dehumidifiers and air purifiers. 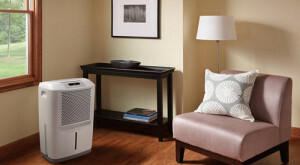 Are you looking for a powerful dehumidifier for your home? The FAD704DWD is a strong unit with a capacity of drawing up to 70 pints of moisture from the air in a day. Its high capacity makes it a suitable system for medium and relatively large rooms. Frigidaire has been there for a while, and at the Air Geeks, we must confess our favorable instinct when we review their products. As you know, a good brand (at least in our books…) means sturdy products and reliable service, should something happen. It also means a price premium of course, but who knows what it saves you in the long run? And we think this information will help you to make an informed decision. So, without further ado, let the test begin! If there is high humidity in your surroundings, it is highly likely that there will be excess moisture in your house. With a 70-pint capacity, the FAD704DWD is capable of drawing high amounts of moisture from your room. By lowering the level of humidity, this unit creates an environment that is unsuitable for mold and mildew. Excess moisture can also damage your furniture and other possessions. If your space is approximately 1400 square feet, then the 70-pint FAD704DWD is a good option for you. The FAD704DWD features a special antibacterial filter that ensures that your room is free from bacteria, unpleasant smells, and airborne particles. Makes up for a cozy atmosphere! It also comes with a 16.3 pint tank, to store the water that it pulls from the air. You can easily access this tank whenever you want to empty it. In addition, this unit is designed to allow continuous operation. All you will need to do is to position it close to a suitable drain. What we also liked is the freedom of mind that it allows : to avoid water spillage on your floor, this dehumidifier features a full tank alert system. If the reservoir is not emptied immediately, the system goes off automatically. Despite all this, we have noted that the reported cases of leaking units are many. Whereas the majority of these instances could be due to delayed maintenance (as some of our readers / testers acknowledge it), cases of water leakage have also been reported for new units. It is always important to consider the ease-of-use of an appliance before purchasing it. This dehumidifier is designed to enable you to control the relative humidity of your room effortlessly. Once you have set the humidity level, the unit pulls excess moisture from the air until the desired level is achieved. In case you want the system to run continuously, draining the accumulated water with a hose to an external sink could be a better option. In addition, this dehumidifier features handles and wheels to allow the user to move it from one place to another with ease. Is this unit durable? The brand might be great, but what about this specific product? The durability of any appliance is mainly determined by how the unit is used and whether it is serviced regularly or not. Well, yes. In spite of a few reports of component failures after 1 to 2 years of use and zero maintenance, this unit is very sturdy and reliable in the long run. A home run, here. Impressively effective dehumidification. From what our tests indicate, this is a highly effective unit for removing excess moisture from the air. It lowers the relative humidity of a room faster than most units of same capacity. Quiet operation. This unit is quieter than most dehumidifiers of same capacity we tested. But remember : as with any dehumidifier, don’t position it close to the television at the time you’re listening! Water leakage. We have noted that the number of complains related to this issue are many. As such, we can only conclude that chances of getting a leaking system are slightly higher. The dehumidifier is working perfectly! We are so glad that we bought it. We live in South Texas and got to use the dehumidifier in our house for the last 2 months of the humid season this year. I love the fact that it has an auto-cutoff float switch when the bucket is full. That allows us to simply turn it on when we go to bed at night and then empty the bucket when we wake up in the morning. We bought a separate humidity monitor to see how accurate the built-in monitor was, and we were impressed that both humidity monitors always read the same level. The unit is definitely not too loud. It sounds like a box fan with a dripping noise (as the water falls into the bucket). I definitely recommend this product for anyone else with high humidity levels in their home. The wheels are nice. Our house layout is really long, so we simply roll it from one end to the other end by using the built-in handle. I love the fact that you can also set the unit to turn off when your desired humidity level has been reached. Works great! We are very satisfied users!! Thank you Amazon and Frigidaire!!" My smaller capacity dehumidifiers were unable to get my basement humidity level down to my target of 45=50%. This one is doing the job (can get it down closer to 40%). I have it draining into a condensate pump rather than trying to constantly empty the bucket. Working great so far." Having evaluated the features of this dehumidifier, we can confidently conclude that it is a highly effective humidity control unit that is suitable for medium and relatively large rooms. This unit runs quietly although it is not recommended to position it next to the television. Although the number of reported water leakage cases is non negligible, our research reveals that most of these units deliver impressive performance. 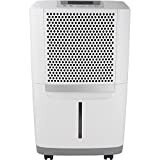 In case you are planning to transform the environment of your room by removing excess moisture, then this is an excellent dehumidifier for you.